A young Rastafarian toaster (rapper) with Reggae Sound System Ital Lion, hopes to rise above the trials of his daily life and succeed at a Sound System competition. London circa 1980. Margaret Thatcher is newly installed in 10 Downing Street, causing fits of gloom in the theatre, film and television world. Punk rock is making a noisy exit from the music scene, to be succeeded by the easier-on-the-ear mod and ska revival. Then along comes Babylon (1980 d. Franco Rosso). Notwithstanding the X certificate, and the questionable use of subtitles, Babylon was an instant classic, akin to that other legendary reggae music film, The Harder They Come (Jamaica, d. Perry Henzell, 1972). 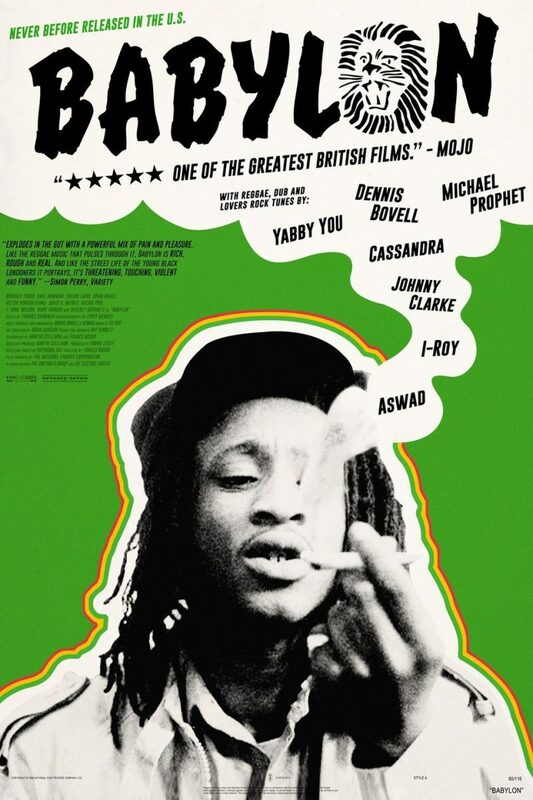 Babylon is a potent mix of music and social commentary, flawlessly photographed by the celebrated Chris Menges (Local Hero, 1983; The Killing Fields, 1984; The Mission, 1986) and with an extraordinary ‘starry’ cast headed by actor-musician Brinsley Forde (Brinsley Dan) as ‘Blue’, the alienated young man at the heart of the story. Screenwriter Martin Stellman (Quadrophenia, d. Franc Roddam, 1979) and director Franco Rosso (Dread, Beat An’Blood, tx. BBC, 7/6/79) have crafted a superb, truthful film that stands up more than twenty years later. Set predominantly in South London, it presents a portrait of the young black community in London different from the tabloid stereotype. These black people are not muggers, rapists or chronic thieves. They are ordinary young black guys at the sharp end of inner city survival with dreams and fears of ordinary young people in general. Except of course that just like the subletted garage where they house their equipment and play their tunes, their lives are hemmed in by the predictability of poverty, disillusion and the randomness of violence that can erupt at any time.